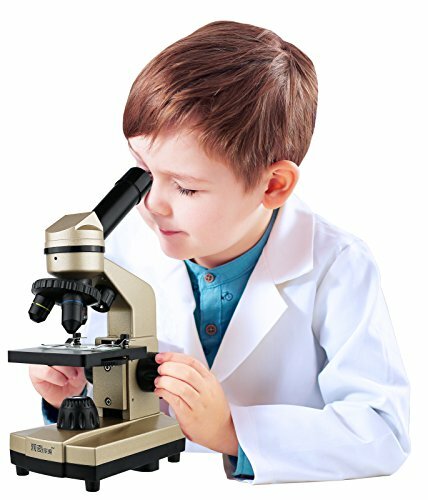 Kids educational expanded laboratory microscope kit with over 50 tools and accessories. Encourages and develops your child's interest in science and chemistry and gives them a hands-on science experience. Zoom in and zoom out with its 360 degree rotatable zoom lens with 40x-400x magnifying power, and top and bottom LED illumination lights. Includes all necessary tools for a beginners laboratory; specimen slides, blank slides, petri dish, stirring rod, magnifier, specimen vials, tweezers, and more!. Runs on 4 AA batteries (not included). Encourages and develops your child's interest in science and chemistry and gives them a hands-on science experience.